Smoke Free meeting hall provides a safe and friendly place to meet others who share in a wish to honor our heroes and promote American principles. Guiding today’s youth to develop leadership skills, teamwork, discipline, and a sense of individual obligation to the community, state, and nation. The American Legion was born at a caucus of the American Expeditionary Force ( A.E.F.) in Paris, France in March of 1919. This caucus was the results of a proposal by Lt. Col. Theodore Roosevelt Jr. to a group of representatives of A.E.F. divisions and service units. His vision of a fraternity of war time veterans bonded by a devotion to God and Country and dedicated to fair and equitable treatment for all veterans, particularly the disabled, and the widows and orphans whose loved ones paid the ultimate price for freedom won him the affectionate title, " Father of The American Legion". Maurice K. Gordon a major in the 36th Division, had the honor of naming the new organization. The blueprint of The American Legion and the Preamble to the Constitution of The American Legion was put in final form at the general caucus May 8 - 10, 1919 in St. Louis, Mo. Founded in 1919, the American Legion Auxiliary is the world’s largest women’s patriotic service organization. Through its nearly 10,500 units located in every state and some foreign countries, the Auxiliary embodies the spirit of America that has prevailed through war and peace. Founded in 1932, Sons of The American Legion members include males of all ages whose parents or grandparents served in the U.S. military and were eligible for American Legion membership. 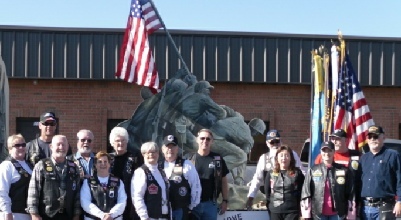 Founded in 1993, American Legion Riders chapters are well known for their charitable work, which has raised hundreds of thousands of dollars for local children's hospitals, schools, veterans homes, severely wounded servicemembers and scholarships.